The ErgoStyle HyLo reinvents today’s adjusting table with numerous upgradeable features. The base table expands your practice with its advanced tilt mechanism, featuring a controlled safety system and constant tilt speed. 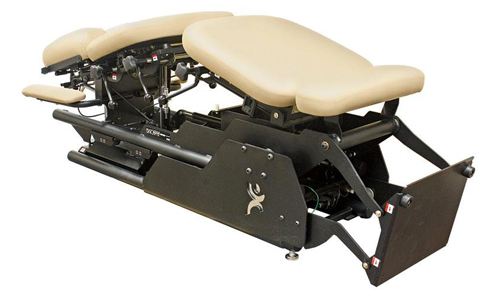 Upgrade your options by adding power chest and pelvic extension (extends 14.5″) with single side control; our patented, free-falling Accelerator™ III Manual Cocking Drops (Patent# 6,679,905); foot controls; and super silent air compressor options.